Multi-Disc CD/DVD special package features dazzling performances of Beatles, Wings and solo classics from Citi Field, formerly Shea Stadium, historic site of The Beatles' Landmark 1965 Concert. Paul McCartney's historic three-night musical christening of New York's Citi Field, witnessed by 120,000-plus attendees and universally hailed as a concert experience for the ages, will be immortalized November 23 with the release of 'Good Evening New York City'. This momentous musical experience will be available in two formats: a 3-disc (2 CD + 1 DVD) standard edition and a 4-disc (2 CD + 2 DVD) deluxe version featuring expanded packaging and a bonus DVD including McCartney's traffic-stopping, headline-making July 15 performance on the Ed Sullivan Theater marquee (including bonus numbers not aired on the Late Show with David Letterman broadcast). As the inaugural musical event at Citi Field, the site of the former Shea Stadium, the July 2009 shows held special significance not only for McCartney but for generations of his fans. The shows were performed on the same hallowed ground that The Beatles, in 1965, played the 34-minute show that would set the precedent for the modern day stadium rock show, and where in 2008 McCartney joined Billy Joel for the final rock show before the original stadium's demolition. As documented on 'Good Evening New York City', 'I'm Down' from the 1965 set list was revived for the Citi Field shows. Other highlights of 'Good Evening New York City' include faithful takes on Beatles classics 'Drive My Car', 'Got To Get You Into My Life', 'The Long And Winding Road', 'Blackbird', 'Eleanor Rigby', 'Back In The USSR', 'Paperback Writer', 'Let It Be', 'Hey Jude', 'Helter Skelter' and more, plus 'Something' rendered on ukulele gifted to Paul by George Harrison, and a tribute to John Lennon in the form of a medley of 'A Day In The Life' and 'Give Peace A Chance'. Wings era chestnuts include 'Band On The Run', 'My Love', 'Let Me Roll It' and the pyrotechnic tour de force of 'Live And Let Die', while timeless McCartney solo material ranges from 'Here Today' to the upbeat 'Flaming Pie' and 'Dance Tonight' to a pair of numbers from Electric Arguments, the 2008 album released under the alias of The Fireman. 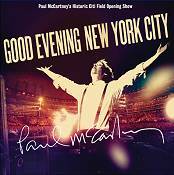 The concert footage featured on 'Good Evening New York City' standard edition features concert footage directed by Paul Becher, who has overseen live visuals for McCartney for some 200 performances and counting. The 33-song 2 hour 40 minute performances were shot in High Definition using 15 cameras and digital footage incorporated from 75 Flipcams handed out to fans over the course of the three night stand. The audio mix, in both stereo and 5.1, was handled by longtime McCartney engineer Paul Hicks, whose credits include the recent Beatles remasters, The Beatles Anthology, Let It Be… Naked, and two Grammy awards for his mixing work on the Beatles' Love album.